A paper published today in Atmospheric Research finds observational evidence supporting the Svensmark cosmic ray theory of climate. The authors find weak positive correlation between cloud cover and cosmic ray intensity at a high-altitude observing site from 1982-2010. 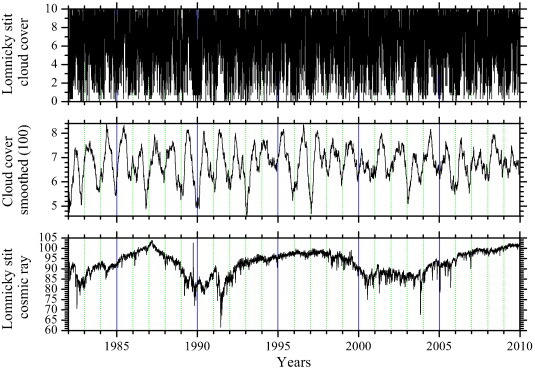 "We studied the relation of cloud cover and cosmic rays during the period 1982–2010 measured at Lomnický štít (2634 m above sea level, in the direction of 49.40°N, 20.22°E, geomagnetic vertical cut-off rigidity for cosmic ray ~ 3.85 GV). Daily means are used. It is seen that the correlations are insignificant for averaging shorter than about one year. We have found weak positive correlation for longer averaging times. Difference in distributions of cosmic ray intensity between the days with cloudless and overcast sky level at α = 0.05 is found in the data." The Svensmark cosmic ray theory of climate is only one of many solar amplification mechanisms that have been described in the scientific literature. 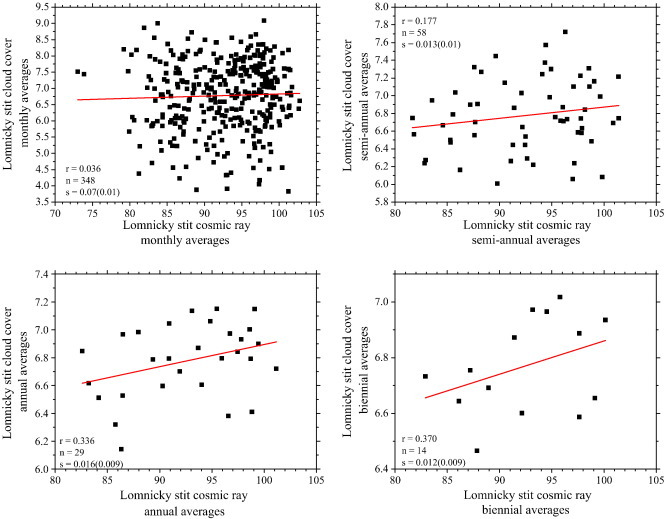 Weak correlation between cloud cover and cosmic ray intensity observed at a mountain. We studied the relation of cloud cover and cosmic rays during the period 1982–2010 measured at Lomnický štít (2634 m above sea level, in the direction of 49.40°N, 20.22°E, geomagnetic vertical cut-off rigidity for cosmic ray ~ 3.85 GV). Daily means are used. It is seen that the correlations are insignificant for averaging shorter than about one year. We have found weak positive correlation for longer averaging times. Difference in distributions of cosmic ray intensity between the days with cloudless and overcast sky level at α = 0.05 is found in the data. In addition to the experiments and clarification of physical mechanisms behind the relations studied here, longer time intervals and analysis at different sites with respect to cut-off rigidity and sea/continents along with the satellite data are important for progress in understanding the cosmic ray–cloud relation questions, at least from the point of view of empirical description of the dependencies. 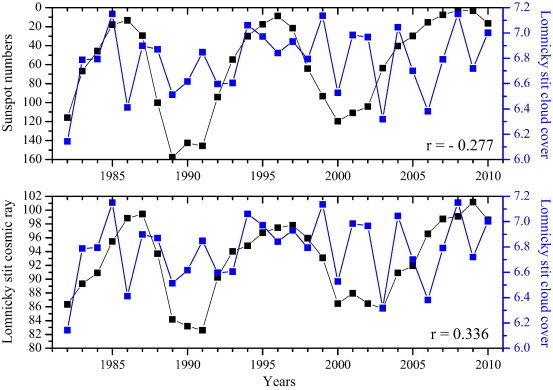 Positive correlations between cloud cover and cosmic rays on various timescales.